Home / ACE Festival / Blunderbus Theatre Company / FEATURES / plays / stories / theatre / Do You Believe in Dragons? 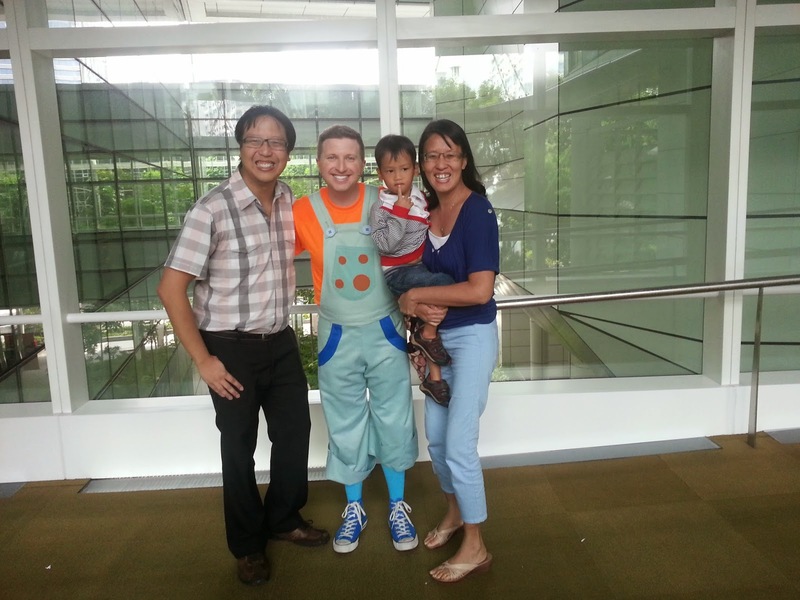 A review of “Dotty the Dragon”, a production by the UK-based Blunderbus Theatre Company. This review was written for local family portal Little Day Out. With that kind invitation, we are drawn into a charming Village; one whose inhabitants are happy everyday (apart from the usual neighbourly grouses). And although there are rumours of a great green creature which casts its shadow when it flies over the skies, no one has actually seen it face to face. Z enjoying his fourth ACE! 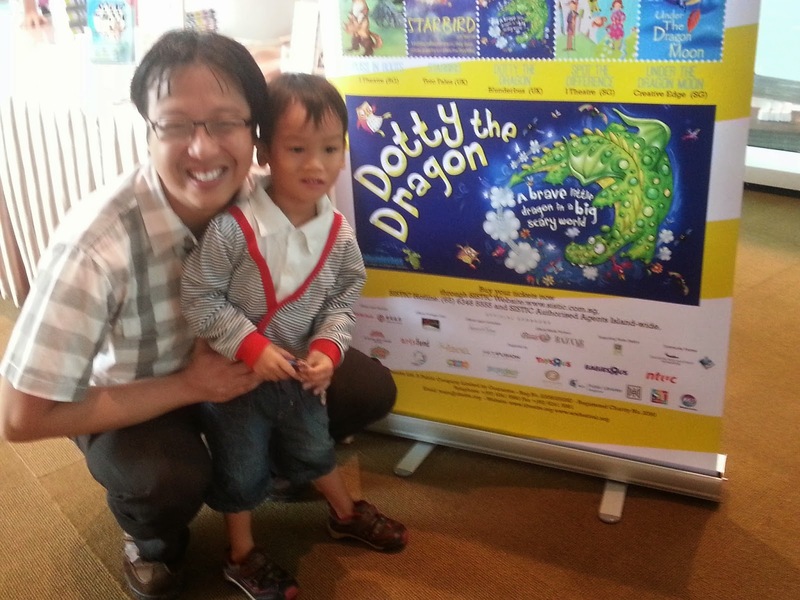 Festival 2014 play - "Dotty the Dragon"
That’s where Little Dotty comes in. Barely 10 days-old, Dotty yearns to make her maiden flight down to the little village below her castle. She can see the children playing happily everyday, and she desires to join them. And so she does; despite the gruff resistance from her father, a strict old creature simple known as Mr Dragon. Dotty the Dragon is a charming little tale, and its story plays itself out naturally, winning the hearts of its audience both young and old. The key story themes of independence versus over-protectiveness, fear versus acceptance, and loneliness versus friendship, draws a healthy tension as the story pans out. The 3-men cast is spectacular as they weave the story together, in the manner of good old-fashioned storytellers. And the light touches of British humour make for an enjoyable outing at the theatre. What was extraordinary about Dotty the Dragon was the intricate sets, pieced together painstakingly and convincingly, to create a lovely village scenescape; almost like parts of a jigsaw puzzle. Then there are the dazzling costumes and puppets, which complete the imagery of a simple village teeming with people, each larger than life. It is also magical to watch the seamless interplay of puppetry and costume. Dotty, for instance, is first seen in a delightful dragon costume. She then transforms into a puppet when she flies down from her castle, only to change back again to her original form when she reaches the village. "Villager" Andrew Alan Kent smiles for the camera with our happy family. The strength of the production is in the way the cast relates to the audience. There is strong audience interaction at the start, where the actors learn the names of the children and use these names as part of the story. There are also times when members of the audience are dragged up on stage. This reviewer, for instance, was cajoled to play the part of an imaginary dragon, flying through the village with a loud roar. much to his own enjoyment and (hopefully) also for the entertainment of the rest of the audience. Dotty the Dragon is part of the ACE! Festival 2014, and runs from now to 8 June. It is recommend for children aged 3 to 12.